If you are looking to stay in a budget hotel and at the heart of Kuah town, then Coco Valley inn could be a good choice. The location is central and the shops & eateries are around the corner. In fact this is a great place if you like to do duty free shopping in Kuah. There is a large duty free store (Coco Valley) in the building where the hotel itself is located. So just go downstairs if you need to buy duty free items like clothes, chocolates, perfumes and so on. The Night Market also sets up (on every Wednesday and Saturday) very close by and within easy walking distance where you can get all sorts of cheap & yummy local food and other local stuffs to buy. There are also numerous souvenir shops, hawker stalls close by. A taxi stand is located opposite to the hotel. So it's a very convenient location for getting around the island. Coco Valley inn is a small budget hotel and has only 10 rooms. During high season, it's on demand and therefore you should book the hotel well in advance. There are several kinds of rooms in the hotel - Standard Single, Double, Twin and Superior Triple. The triple bedded room is the family room. It's one of the very few budget hotels in Kuah which offers family rooms. Beds in the rooms are quite comfortable. The rooms all have standard but basic furnishing. There is 32" LCD TV in all rooms, however the channels are limited as in most budget hotels in the island. All rooms have hair dryers as well and high speed wi-fi internet. The internet speed in the rooms is quite good which is a great bonus in this hotel. While there is no drinking water served in the rooms, you can get it from the water machine kept at the lobby (both hot and cold, and unlimited). The reception is open up to 10pm after which the main gate gets closed. So if you want to enter after 10pm, you will need to use the card scan to open the door. If you are checking in late at night, make sure that you notify the management in advance or call up the reception number from your mobile. You may be otherwise stranded on the street. If you want to have quick and easy access to the beaches, then this hotel and for that matter Kuah town is not suitable. You should be choosing a hotel in a place like Pantai Cenang. Like most hotels in the island, the check-in time here is 2pm and check out at 12noon. There are some steep stairs to climb to the rooms and there is no elevator. Sometimes you wish the staffs help you to carry your luggage which they do if they are available and free. 1) The location is central in Kuah and excellent. You can take your breakfast, lunch and dinner in any of the close by restaurants or eateries. It's a great location for duty free shopping. Langkawi Saga Shopping Center and Langkawi Plaza are both within easy walking distances. The taxi stand opposite to the hotel gives an opportunity to easily get around the island. 2) Nice spacious and clean rooms. However there have been some complaints about ants in the rooms although we ourselves didn't find any. I suppose it happens if you keep any sweet substance or beer etc open and invite the ants. 3) Staffs are generally quite friendly. 4) The wi-fi in the room is quite fast and good. 1) There are no windows in the rooms except in the family room. So when you wake up in the morning, you won't know if it's still dark outside or there is daylight. 2) They won't usually clean up the rooms and make the beds during your stay unless you specifically tell them to do so. But still they won't do it everyday. This seems to be the case with almost all budget hotels in Langkawi. 3) More international channels in the TV would help foreign tourists. 4) You need to go out and take your food. 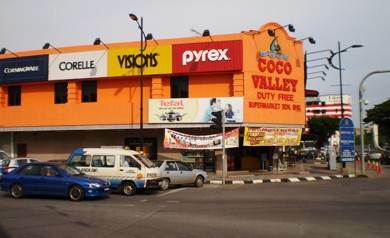 Coco Valley Inn is located in central Kuah town which is about 20kms from the airport. From the airport it takes about 30 minutes to reach by taxi.